Honorary life membership is granted to members who have rendered exceptional service to Oral History NSW and/or the broader oral history movement in Australia over a period of at least 10 years. The Oral History Australia national website carries a full list of life members in all states. Sandra joined the Oral History NSW in 2000 after a 20 year career working for several of the largest overseas aid not-for-profit associations managing community development projects across the Pacific, SE Asia, India, Bangladesh and Africa. This experience offered her opportunities to hear first-hand the stories of many people as they talked about their hopes for their children and local communities and worked together to make them strong and resilient. Sandra commenced recording oral histories for several local libraries, completed a Diploma in Public History at UTS, joined Oral History NSW Committee in 2001 becoming President in 2010 and a member of national Oral History Australia committee at a critical time in the Association’s life. Sandra’s many years of experience in fostering community development both in Australia and overseas led to her commitment to see the strengthening of the association to meet current governance standards for not-for-profit organisations and bring the Association to greater effectiveness in both promoting and preserving oral histories. Alongside a significant administrative load Sandra found much enjoyment and satisfaction in developing opportunities to build up communities of oral history practice around New South Wales and encouraging archiving and use of oral histories. What Sandra loves most about this work is the fascination, sense of privilege and discovery in sitting down with someone who is prepared to share something of their life experience. She feels an awareness of others personal lives and histories does influence our response to the broader world. Virginia grew up in London. Once she had qualified as a physiotherapist, she set off working and travelling in the Pacific and Australia, Her curiosity about other cultures led her to study social anthropology and South Asian history at the School of Oriental and African Studies, London University. She moved to Australia in 1978. She ran a local studies collection for Pittwater Council for 15 years and has worked as a freelance historian for over twenty years, completing a MA in Public History at the University of Technology Sydney in 2003. She has written several historical publications including Liverpool Migration History Project for Casula Powerhouse in 2009, Uncovering Rockdale’s Migration Heritage Story, 2013. She has curated exhibitions The Nature of Manly and Summer Days, The holiday house on the Northern Beaches for Manly Art Gallery & Museum. She created a historical interpretation wall for a shopping centre in Balgowlah, and another at Shellharbour. In all her work she appreciated the opportunity to enrich the history with first-hand experiences gained through formal, or informal, interviews. The last decade has seen a growing demand for oral history in many contexts. Virginia has been fortunate to interview for the National Library of Australia project: Forgotten Australians and former child migrants, as well as City of Sydney Council oral history projects: Work in the City and Shelter. She has enjoyed projects interviewing: long-term residents of Randwick, migrants in Rockdale about their appreciation of local parks, those working in the thoroughbred industry and stables in Randwick, staff and parents at NSW regional childcare centres, family carers for people living with mental illness, employees of a pharmaceutical factory, environmental activists, and individuals. Joyce’s appreciation for the wealth of untold life stories and ways to help people retrieve their memories comes from her work in Aged Persons Homes. She found that for many frail older people personal esteem was bound to the memories of past life experiences and successes. Allowing people to tell their life story and reminisce about past experiences was a very valuable therapy for older people whose abilities in the present were very restricted. 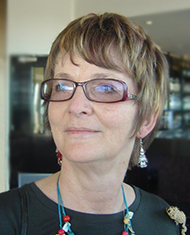 Joyce trained as a Diversional Therapist and then completed a Masters Degree in Leisure Studies at UTS. She later lectured in the School of Occupational Therapy, Cumberland College of Health Sciences, University of Sydney where she always encouraged students to listen to, respect and value the life stories of clients. Joyce says that it is her background of knowing how rewarding it is for the individual to have their history valued and recorded that has inspired her to continue working in the field of oral history. Joyce served as OHAA NSW Public Officer from 2001 to 2012. A very valuable long standing member of the Committee, she was both assistant and editor for the production of Voiceprint the NSW Newsletter for 15 years. Encouraged and trained by her mother, oral history pioneer Hazel de Berg, Di began work as an oral historian in 1983. Since then her passion for oral history has seen her involved in local history, Aboriginal history, Holocaust history, corporate history, school and family histories. Di is an accredited interviewer for the National Library of Australia and has conducted numerous interviews with notable Australians, including poets, writers, composers, religious leaders, social historians, publishers and singers. She was an interviewer for two of the National Library's major oral history projects - The Australian Response to AIDS, and The Stolen Generation, Bringing Them Home Oral History Project. In 1987 Di became a member of the Oral History Association of Australia and was an active and highly valued member of the New South Wales Committee from 1992 to 2011. An early member of the Oral History Association of Australia, Janis has served on the National Council on a number of occasions, and co-edited the OHAA Journal. More recently Janis has served on the Editorial Committee to support the establishment of peer review and recognition of the journal for both academic and general audiences. Janis has been President and Journal Editor of the International Oral History Association and initiated the hosting of the very successful IOHA conference in Sydney. Oral History has been integral to her academic teaching career. She pioneered the teaching of oral history as a university subject and has inspired many of her students to pursue oral history. Participation in many community oral history workshops has been complementary to Janis’ academic work. Her published work is extensive – books, monographs, articles, conference and seminar papers all reflect her passion for bringing the oral history message to diverse audiences. Rosie was for over 10 years the national president of the OHAA (now Oral History Australia), retiring in 2007. She was the president of the NSW Association from 1993 to 2010. During this period she fostered an active partnership between the OHAA and the State Library of New South Wales where she was curator of oral history. Rosie conducted numerous seminars and workshops in Sydney and regional NSW and attended and presented a paper at all the national OHAA conferences from the 1990s to 2010. She was a co-convener of the international oral history conference in Sydney in 2006. Together with the NSW Oral History Association committee she was instrumental in the establishment of the Hazel de Berg Award for Excellence in Oral History. Louise was a founding member of OHAA NSW in 1979, editor of the 1980 journal, a promoter of the use of oral history in academe and one of the compilers of 'Oral History. A Handbook' in 1988. She was a driving force in the major oral history project, NSW Bicentennial Oral History Project and edited the oral history component of ‘Australians 1938'. With a few others, she kept the NSW branch of the OHAA active through the 1980s until the State Library of New South Wales set up the Oral History Program in 1991.